The rooftop at the Estrel not only offers a view of Germany’s capital city, but ever since last summer, the hotel’s executive chef, Peter Griebel, has been harvesting organic vegetables such as tomatoes, zucchini and cucumbers from the new rooftop garden. Sometimes, he even returns to the kitchen with chillies, Bavarian figs and herbs, which he cooks up into something delicious for the guests at Germany’s largest hotel. Located an impressive 50 meters above the ground, the 42 square meter greenhouse is Germany’s highest rooftop conservatory. The greenhouse dome, developed by Brandenburg-based company SUNfarming, is lined with solar panels that direct energy right where it’s needed most. Partial shade provided by the greenhouse creates a microclimate with low evaporation levels, and hydroculture gardening promotes the growth of a wide range of products that benefit from a watersaving drip irrigation system. SUNfarming systems allow plants to be grown in places that would otherwise remain infertile, from rooftops to resource-poor regions, such as crisis areas and developing countries. That’s why the Estrel’s new greenhouse system does more than just put food on the table in an environmentally friendly way – it also serves as a showroom where interested SUNfarming customers, including ambassadors from African countries, can see the greenhouse in action. 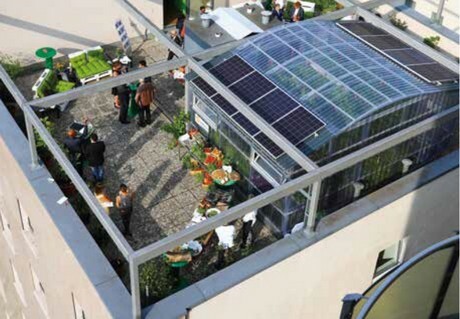 Peter Schrum of SUNfarming answered three questions about the rooftop greenhouse for Estrel Story Magazine. The idea behind your agrosolar greenhouse concept is to help sustainably improve living conditions for people in developing countries and crisis regions. What exactly does that look like? "SUNfarming Food & Energy combines the production of renewable photovoltaic energy with water-saving food production technologies, job and education opportunities in the German solar tech industry, e-mobility concepts, organic food technologies and hydro- and aquaponics. As part of the Marshall Plan with Africa, SUNfarming is partnering with local universities and companies to develop Food & Energy facilities in Mauritius, Madagascar, Zanzibar, Kenya, Uganda, Senegal, Nigeria, Ghana and Tunisia. Each of these facilities will cover over 50 hectares of land parcelled into sections of 10-20 hectares each. 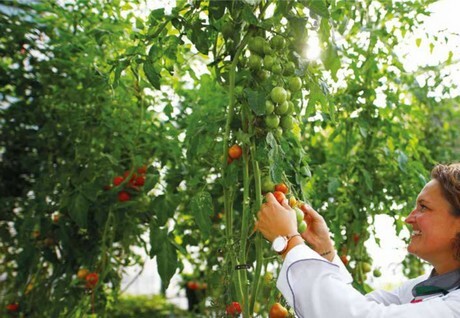 Integrated vocational schools will provide educational opportunities in organic food production to millions of women, who are then equipped to open franchises of their own." How many of your greenhouses are already in use around the world? What goals have you set? "SUNfarming has over 1,000 hectares of photovoltaic systems in Germany, where we’ve spent the last ten years amassing experience in organic sheep and chicken farming, as well as potato and vegetable farming. In addition, we have special Food & Energy testing facilities in operation in Berlin’s Erkner district as well as on the rooftop of the Estrel in Neukölln, in South Africa and in the Bahamas. The oldest of these has already been in operation for six years. Our next big project is scheduled for spring 2019 and will be a two-hectare-large Food & Energy facility near Adana, Turkey. In Germany, we’re planning a 1.5-hectare SUNfarming greenhouse pilot facility in collaboration with GGA Rathenow, a “green” gas project in Brandenburg. This project is scheduled to begin in summer 2019." The greenhouse at the Estrel is more than just a showroom for ambassadors from African countries. You’re also working with Executive Chef Peter Griebel to cultivate a variety of herbs. What’s that project about? "In the Estrel’s rooftop greenhouse, managed by Executive Chef Peter Griebel and his crew, we’re optimising farming techniques and flavours for a range of organic herbs intended for cooking as well as medicinal purposes. The combination of organic fertilisers and hydroponics we develop here will be put to use at a production facility in Rathenow. 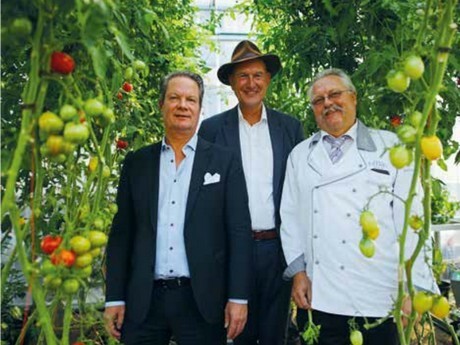 As our project partner, the Estrel is responsible for helping us to grow the most flavourful herbs possible."